superduke forum • View topic - Who has installed heated grips? Thinking about installing the OEM heated grips on my 2014, has anyone done it? Can you describe how to do it? Did you have to do any drilling? 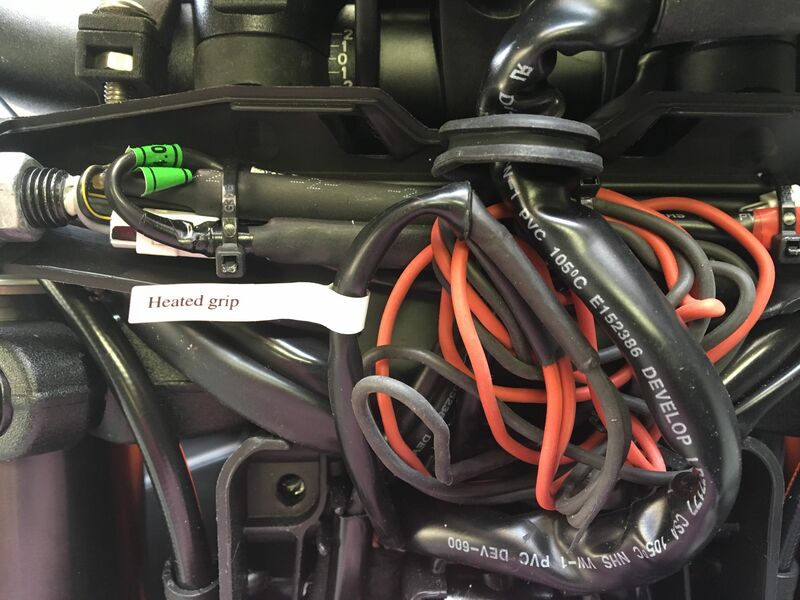 Re: Who has installed heated grips? Plug and play, no drilling required. The plugs are behind the headlight so you will have to lower that down out of the way and feed the wires thru but it's a very easy installation. Well worth it to me as I ride year round and the heated grips work great IMO. Yep, ditto that. Even nice to flick them on just a slightly chilly day. Anyway, I successfully installed the heated grips yesterday! Most difficult part was getting the left grip off....it was like the grip had either melted or been glued on up near the controls. Had to tear it a bit to get it off, then scrape some material off with a razor blade. Also had to loosen the control housing and move it a bit to get the new grip far enough on to line up with the bottom hole. Didn't bother with a top hole, I think one will be enough. Seems pretty solid. Hope this info helps the next person who is looking to do this. Also, if you do take the screws out of the controls housing, when you put it back on make sure not to tighten the screw near the front of the housing, next to the brights button too much. I tightened it up, and my brights button would no longer spring back for flash passing. So I had to loosen the screw quite a bit to get it to work again. So did you connect a pair of non KTM grips to the 1290s wiring so they are controlled from the menu? If so, did you wire them in series or parallel?